- To promote, propagate and advance the Science of Yoga & Naturopathy and Para Medical Technology. - To established the faculty to control the examination of teaching and educational institutes or colleges etc. and to award Diplomas, Certificates etc. thereof. - To determine a uniform code of conduct for Practitioners Refistered by N.I.H.S.R. - To improve public healthin accordance with principal of Yoga & Naturopathy systems. - To provide medical aid in rural area. - To provide the adequate trainings for unemployed youth and to help them setting up under self employment schemes. Paramedics, a trained medical professional can get employment anywhere in the hospitals, nursing homes or can also get employed in the private medical clinics. Nihsr is best paramedical institutes that offer courses in the field of Para-Medicine, at degree and diploma levels. 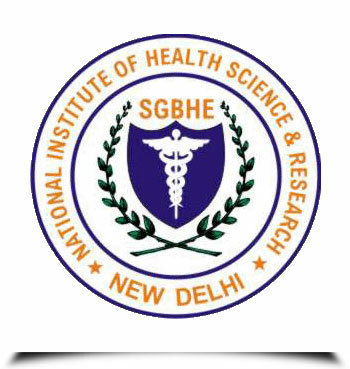 I am extremely happy to welcome you to the National Institute of Health Science & Research. My chief aim in founding this educational establishment was to achieve social transformation; this is re-birthing of Yoga & Naturopathy. First of all, I would like to thank you for showing interest in the Yoga & Naturopathy, which is becoming more & more popular throughout the world. Our carefully selected, dedicated teaching staff, without whose help I would not have been able to expand the institute nationally, Take Care of the all round development of the students. NIHSR is my family and dear students are its members. Let us resolve to make it one of the leading institutes of the country. There is great demand of the latest foreign equipments, in India these days, Govt. Hospitals, Nursing Homes, Medical Examination Laboratories etc. have been established and are in operation in all the cities of India. These all are well equipped with foreign equipment based on latest modern technology this is great need of expert technicians to operate over them, but they lacking in number due to shortage of training institutes. As a consequence, untrained person who had been to deploy every where, are in turn gradually trained but the process does not given a 10% solution of problem. Under the above purview "National Institute of Health Science & Research" has been extending a lot of cooperation by having provided. Trained Technicians fully trained and experience on the subject mentioned here in above. So you have to choose the Para Medical field as per your interested line.